Pineapple has such a nice flavor profile. It can lend itself nicely to savory recipes like pizza or pork, and it makes a delightful sweets like the pineapple cake recipe below. I love sweets, in case y’all haven’t noticed. I try not to get carried away (and it’s definitely not an every day thing), but I just get so inspired with ideas for things I want to recreate, and the itch to play in the kitchen gets the best of me. Side note: if sweets don’t fit into your paleo diet, that’s ok! I recently had an internet person (I don’t know who he was, he was just a person on the internet, ok?) berate me for sharing my paleo Chick fil A nuggets. I told him not to be so uptight and to live a little and he went on to tell me my nuggets were poison. Mmmmk. I’ve always really loved pineapple upside down cake. I used to make the boxed variety on occasion and made a homemade version maybe once before going paleo. I mentioned to my oldest that I wanted to recreate a paleo pineapple cake recipe and he did not stop asking me to make it pretty much every day for two weeks until I did so! So, while our Paleolithic ancestors might not have been whipping up pineapple upside down cake, this modern pineapple cake recipe is full of only the good stuff: healthy fat, honey, fruit, pastured eggs, and absolutely NO GRAINS OR GLUTEN. A note on fats: butter is my preferred choice for baking and cooking. It’s just my favorite fat to use thanks to the perfect flavor and texture, and it’s fairly easily tolerated because it doesn’t contain protein like milk does; it’s just the fat. However- if butter doesn’t work for you, use whatever floats your boat! Most recipes calling for butter (including this one) can easily sub palm shortening, ghee, or expeller pressed coconut oil. You do you. When I did finally get around to making it, it was unanimous: we all loved it. This cake didn’t last a night at our house. I caught the toddler polishing off the last of it off the cake platter and that was that. Line a 9" cake pan with parchment, then put 1/4 cup butter and 1 tbsp. coconut sugar in the pan and place in the oven while it's preheating. Remove when the butter is melted and give it a little whisk to be sure the coconut sugar is distributed throughout the butter. In a large mixing bowl, combine eggs and honey with a hand mixer or whisk. Melt the remaining 1/2 cup of butter and add the butter and vanilla to the batter and mix well. Add the coconut flour, salt and baking soda and mix until smooth. Place the pineapple rings evenly on top of the butter and coconut sugar mixture in the cake pan, then place a cherry in the center of each one. Pour the batter over the pineapple rings, then gently bang it on the counter a few times to ensure it covers the pineapple rings well and to get out air bubbles. 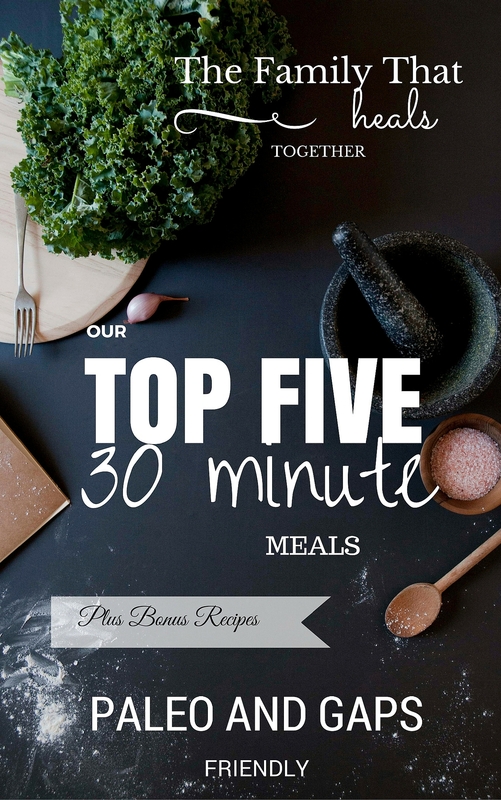 Bake for 34-38 minutes. It is done when it is springy but will still be a little moist. You can check with a toothpick by poking it down in the center of the cake. If no crumbs come off on the toothpick, it's done. Set the cake out to cool for about 10 minutes. While it's still warm, gently loosen the sides of the cake from the pan with a knife, then place a cake stand base or flat plate on top of the cake pan. Using one hand to hold the base and the other hand to hold the cake pan, flip it over so that the base is on the bottom and the cake is on top of the base. Gently remove the cake pan so that the cake slides out onto the base. 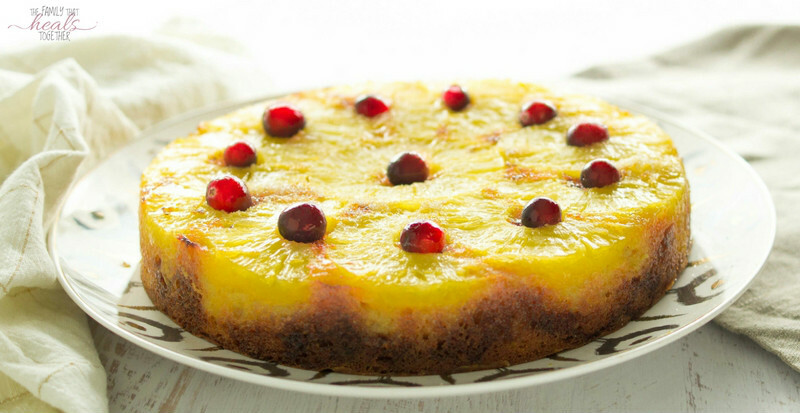 If you love pineapple upside down cake, you’ll love this easy paleo pineapple cake recipe!